Moving can be stressful—between packing, loading and unloading boxes, finalizing last minute plans and driving to your new home, there is a lot going on. And when you add a pet to the equation, things can feel even more stressful. While dogs usually welcome the opportunity to go for a car ride, other pets like cats, hedgehogs and fennec foxes may be less enthused about a trip in the car. At Schreiner Realty, your total happiness and comfort are our priority. We want to ensure that your venture to your new home is as seamless and stress free as possible. Your dream home awaits, so why let your move be a complete nightmare!? To ease the stresses associated with a long-distance move with your pet, check out the list of tips we’ve come up with, below. Important medications, vitamins, supplements, etc. 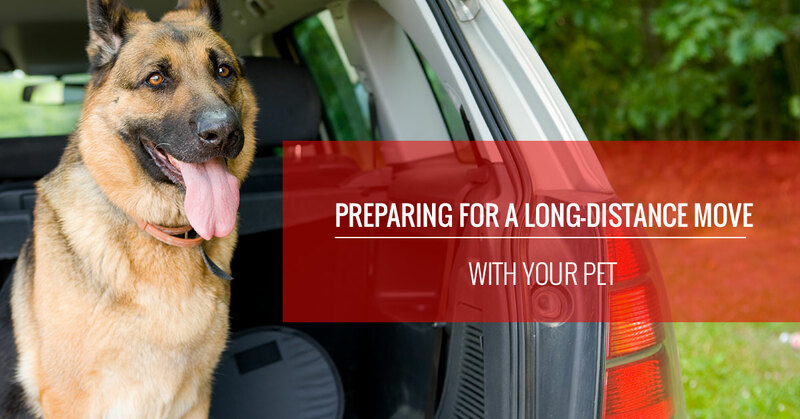 Scheduling a vet appointment is important to ensure your pet is physically and emotionally ready for your journey. Even if your pet has recently had an exam, an extra check up focused specifically on your pet’s traveling accommodations is a good idea. Pets experience stress in different ways, and you, better than anyone, can explain to your vet what your fur baby acts like when riding in a car or in the face of extreme change. If, for example, your cat panics and loses his hair the second he leaves your home, ask your vet if there is a mild sedative she can prescribe. Make a list of other topics you want to discuss with the vet including travel-related behavioral changes, car sickness and introducing your pet to a new environment. The vet will be able to offer recommendations as well as perform a thorough health exam and provide you with a copy of your pet’s medical records. If your pet has never worn a collar with tags, now is the time to break that trend. In fact, while traveling, your pet needs to be wearing its collar the whole time. You never know when an open car door could turn into an escape route for your pet. Some animals, when panicked, run away and won’t respond to their owner’s call. Yes, a collar with tags doesn’t guarantee your pet won’t try to escape, but it does guarantee that when your fur baby is found, the rescuer will have an easy time getting ahold of you. When you engrave your pet’s ID tag, make sure to include your name and a recent cell phone number. Microchipping your pet is another great measure you can take to ensure that if your pet escapes and loses its collar, the two of you can still be reunited, in no time, after your pet is scanned and your information is found on the chip. When traveling with your pet, under no circumstances should you transport your fur baby in the bed of a truck or the bed of a moving van. Things shift in transit, there are way too many unknowns and your pet’s health and safety will be in jeopardy if you attempt these dangerous methods of transportation. Most dog owners are comfortable allowing their dogs to roam freely in the car during a trip. If your dog is going to travel freely, outside of a crate, you will want to make sure he has his collar on at all times and that his leash is attached every time a car door opens. Even the most well-behaved dogs can get spooked or confused during a move and bolt the minute they see an open door. It is not advisable to allow smaller pets to roam freely in your car, however. Small animals are more likely to cause problems because they can sneak into small spaces like under brake pedals or behind stacks of boxes. To keep your pet safe while you travel, invest in a quality carrier or crate. You want to make sure the crate is large enough for your pet to stand and turn around in. Tuck your furry friend’s favorite blanket or bed into the crate to make it more inviting. Whether you are a two-legged or four-legged creature, food is an excellent motivator for everyone. “Hangry” describes an emotion people experience when they are so hungry, they actually become angry about it. The absolute last thing you want while you are moving is a pet that is experiencing “hanger” pains. Pack a small bag of your pet’s food and favorite treats. Not only will you be able to curb your fur baby’s hunger, you will also be able to reward them with treats, praising their good behavior and patience during the ride. If your pet experiences extreme stress when traveling but you do not want to give them a mild, prescription sedative, check pet stores for calming melatonin soft chew treats. The melatonin will help your pet relax and the tasty treat will feel good on their taste buds! Potty breaks are great opportunities for your pet to get out and stretch its legs. Most pets aren’t used to being in confined spaces for extended periods of time, so they will gladly welcome any chance they have to walk around. Have your pet’s water and food bowls ready so you can give them a drink and even feed them dinner, if need be. And if your pet also “uses” the bathroom while you’re stopped, make sure to clean up after them—this is an unspoken etiquette that every pet owner should know and follow, yet how many times have you or someone you know stepped in “it”? Be considerate and use the plastic bags in your pet’s survival kit to pick up after them. While you’re driving, be sure to continually check on your pet to see if they are exhibiting their easily-recognizable “I have to go to the bathroom” behavior. Whether they pace wildly, stare at you intently, or whimper uncontrollably, no one knows your pet better than you do, and you can easily determine when they are letting you know, “Potty please!” If you are on the road and your pet decides it’s time for a bathroom break, pull over and indulge their needs to avoid accidents and anxiety. Remember that time you chose the wrong seat in the car and had to sweat through an entire ride? The sun was beating down on you and everything was unbearable. Remember this unfortunate event when you are deciding where to place your pet’s crate or carrier. Even if your car has air conditioning, prolonged exposure to sun can damage your furry friend’s eyes and skin as well as cause exhaustion, dehydration and general discomfort. If you plan on constantly moving the crate as the sun moves, nice work! If, on the other hand, you need to pack the crate in a single spot, create a quick, makeshift sun shield that will protect your pet from the sun’s rays. Your fur baby will be comfortable and relaxed, and you too will feel comfort knowing your pet is safe and sound. A lot of planning goes into a cross country move. Where are you going to eat and sleep each night? Sometimes, people have a difficult time finding and booking pet-friendly hotels. Pet Friendly Hotels is an amazing site that helps you locate animal-friendly hotels wherever you are traveling. You can search by city, state or zip code. The company works with pet-friendly properties to bring clients the lowest negotiated rates. With more than 25,000 hotels in their database, the chances of you not finding a pet-friendly hotel are slim to none!